Exceptional flours and baking ingredients for both the home and professional baker. 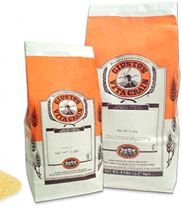 Giusto's has long been a leading processor and wholesaler of organically grown grains. The best bakers and pastry chefs in the country use Giusto’s natural whole grain flours. Now these top quality organic and natural flours are available to everyone online for baking bread, cakes, or delicate pastries. Careful processing of the whole grain has preserved the natural vitamins and minerals. Purchase flour and other baking and cooking ingredients. Find recipes, baking tips and hints. Sign up for the Giusto’s newsletter. 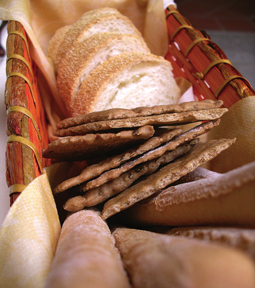 Giusto’s will create special flours to suit the unique needs of chefs. The origin of Giusto’s dates to 1940 when Matthew and Amelia Giusto, Italian immigrants, opened Golden Crescent Health Foods Store in San Francisco. The country was just coming out of the Depression when many people hadn’t been financially able to eat well. Amelia was a believer in the healing properties of whole and natural foods, and even as Americans prospered and moved towards convenience and prepared foods, her baked items were so good that the business grew. Giusto’s eventually closed their retail store, and the bakery began supplying restaurants and other retailers. Chefs and other bakers often asked, ‘What flour are you using?’ so the brothers began to sell their flour. “They were ahead of their time, no question,” Craig explains. “Bleached flour was the norm. But the only Giusto’s flour then (and now) that’s bleached is our cake flour.” By the early 80’s the flour business had grown to equal the bakery, and the brothers decided to focus entirely on organic and natural flour and ingredients.